Hanoi (Vietnam) – September 16, 2018 – At the World Economic Forum on ASEAN, the heads of state of the five member countries of the Mekong region – Viet Nam, Cambodia, Lao PDR, Thailand and Myanmar – affirmed their commitment to shared prosperity and peace. Addressing participants, Nguyen Xuan Phuc, Prime Minister of Viet Nam, said that with a shared history and culture, the Mekong countries envision a joint, interconnected future, and one agile enough to adapt to global shifts. Combined, the Mekong countries have a GDP of $800 million. If it were one country, the Mekong region would be the sixth-biggest country in the world and a member of the G20. Yet despite its significant potential, inter-Mekong trade remains low at just 8% and there are concerns that similar exports, such as rice, could create fierce competition among the five countries. However, Aung San Suu Kyi, State Counsellor of Myanmar, stressed that Mekong countries are focused more on complementarity than competition. “I think we could work together and not just make this a commercially, economically vibrant region, but a region that could be a lesson in how we make our complementarities and common challenges strong, to keep things together, and even to make our competition a healthy kind, which will help us to progress,” expressed Suu Kyi. Discussing physical connectivity in the energy space, Thongloun Sisoulith, Prime Minister of the Lao People’s Democratic Republic echoed the shared Mekong framework, saying the economic “bloodline” should be both utilized and protected. “We should protect the river and think about sustainability, where all member countries protect the environment and we develop it together,” he said, “We should not think that one country is trying to use the river for its own interests only.” The recent dam collapse, he admitted, means that any future construction will require careful planning and design, and assistance from both regional and international stakeholders. Beyond physical connectivity in terms of water, energy, transport and people, Samdech Techo Hun Sen, Prime Minister of the Kingdom of Cambodia, stressed the need for innovative solutions to shared future challenges. 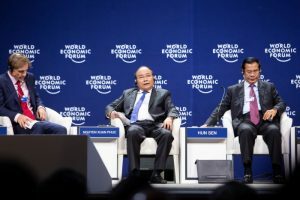 “We have to catch up, I see that for our Mekong countries, the important thing is the connectivity in order to guarantee that all our countries get together in a convenient way, physically and digitally,” he said. In the event of a natural disaster such as a regional flood, he noted, countries such as Cambodia, Viet Nam and Thailand should have agreements in place to deal with cross-border management, encompassing telecommunications and emergency evacuation plans. Towards that goal, Prime Minister Nguyen Xuan Phuc said transformational changes are underway: Viet Nam, Lao PDR and Cambodia, for example, all share a flat roaming rate for telecommunications. The challenge, noted Suu Kyi, is ensuring that increased connectivity is empowering.